Little Big News: Derringer winners! 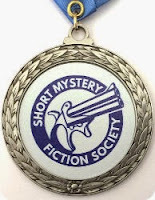 The Short Mystery Fiction Society has announced the winners of this year's Derringer Awards. Congratulations to all! 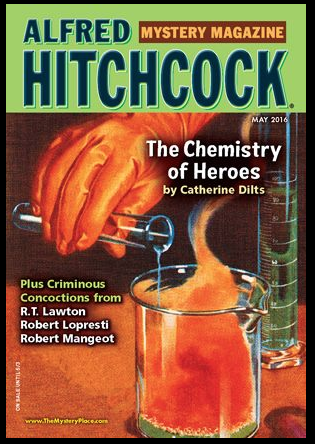 "Heathen Springs," by James L. Ross, in Alfred Hitchcock's Mystery Magazine, April 2016. Nice private eye-type story by Mr. Ross in his second appearance on this page. Hugh Brewster is a disillusioned psychology professor who becomes an investigator for a security company. One of their clients is a movie studio and when the son of a minor star is kidnapped Brewster is sent into the desert where filming had been going on location to try to solve the dilemma. The local cops aren't much help and the studio boss isn't willing to contribute to a ransom: "I'm not hanging out a sign saying I'm a soft touch." But the worst part is thatno one is calling with a ransom demand. If they don't want money than all the other possibilities are grim. The story is good all the way through but what I loved was the ending, a cold conversation between Brewster and his boss that reminded me of Hammett's Continental Op chatting with the Old Man. "Shanks Goes Rogue" appears in the May issue of Alfred Hitchcock's Mystery Magazine, on sale next week. it is his ninth appearance there, and my 26th. 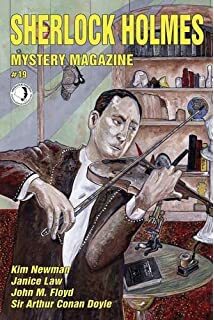 "The Perfesser and the Kid," by Roberta Rogow, in Sherlock Holmes Mystery Magazine, issue 19, 2016. This story takes place on the day of Nikola Tesla's funeral. An aging politician decides to entertain the gathered reporters with the true story of the great inventor's first day in America. We know that Tesla was robbed on the ship and stepped onto dry land with four cents in his pocket. The official version says that he then met a man on the street with a broken machine and fixed it on the spot, thereby earning his first dollar on these shores. Our politician-narrator begs to disagree. He was a newsboy at the time and he tells a very different story involving a pool hall, a gang of street toughs, and Tammany Hall. My favorite part is a scene near the end when Tesla solemnly pays his debts. I can only say: I have known people like that. There is a clever twist at the end of the story. I enjoyed it a lot. 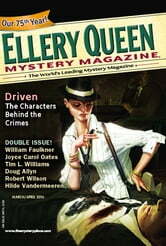 "Upon The Stair," by Declan Hughes, in Ellery Queen's Mystery Magazine, March/April 2016. Last week my choice was about a private eye as bodyguard. This week it is private eye as social worker / couple's counselor. Varied juob description these fictional P.I. 's have. Ed Loy works in Dublin and he hired to keep an eye on Thomas Harrington who has recently become, as Loy puts it, a Famous Irish Writer, and like a number of others in that category, is having trouble adjusting to it. His problems invovle booze, reckless behavior, and possible infidelity. HIs wife wants to know what's going on. But just about everybody in this story has a hidden agenda. All except our hero, and he has to figure it out. A satisfying story. "The Jaguar at Sunset," by John Lantigua, in Ellery Queen's Mystery Magazine, March/April 2016. A nice private eye story by Mr. Lantigua. A Brazilian couple named the Mattos led the fight against development in their region and are murdered for it. Now their daughter Constancia has taken up the cause and is supposed to make a speech in the Everglades National Park in Florida. The bad guys would like to her silence her too but they know that a political assassination in the United States would cause more trouble than it would end. But they can give a plane ticket to Constanzia's bitter former lover, and set him loose in Florida. A lover's quarrel ending in tragedy is no cause for an international incident. Did I mention he is an expert marksman with a rifle and a bow and arrow? A good tale with a strong sense of place. The Short Mystery Fiction Society has announced the finalists for the 2016 Derringer Awards. I am more than delighted that one of the stories is by yours truly. Congratulations to all!